What is Google censorship and how it works in different countries? Learn how works Google and YouTube censorship and why it exists. Even though for the last three years Google has been a daughter company to Alphabet Inc, and doesn’t make their own corporate policy, people still call the whole corporation Google, as it is the largest part of the conglomeration. Alphabet Inc. is currently the second largest corporation on the Planet, vying for first place with Apple, as these companies have switched to the leading position a few times now. This massive amount of income and a large number of companies and industries where Alphabet, usually only referred to as Google, has influence means that any wrongdoing on the part of the company will influence people around the world. This reach of the tech giant brings us to a very interesting twist, and that is that most people who would like to learn about Google censorship attempts and successes will use their service to do so, which will often be censored. Aside from the search engine, Google also owns the biggest video streaming service on the planet, YouTube, which has progressively expanded their company policy throughout the years and censored both creators and certain advertisers, as well as pushed for several company policies which were very political and very partisan in nature. Because of these pushes by Google (Alphabet Inc.) to police internet freedom worldwide, many people are opting to use alternative search engines, such as DuckDuckGo, and to use reliable multi-country VPN servers so to observe content which has been deemed unsuited for viewing in their own country. The term Censorship comes from the name of a magistrate in the Roman Republic named the Censor. This position was most notable for maintaining the census but has also dealt with public morality, which is one of the primary functions of censorship. As time passed by, and especially with the rise of the Christian Inquisition in Europe, what was considered immoral has changed considerably, as not only to include obscene and violent behavior, but also any criticism towards the government, the institutions (mainly religious) and against protected groups. In the 20th century, censorship became viewed as a strictly undemocratic action akin to propaganda, and rightfully so, as it was utilized by authoritarian regimes around the world to safeguard that regimes grip on power. During the last century, it was a gross accusation on any media or government in the West if mentioned that they conduct censorship, or any similar pressure on the free press and public discourse. With the invention of the internet, and the rise in the possibility of even the ideas on the far fringe of the political and social spectrum to easily share their idea, even societies in the West have accepted some degree of internet censorship, but as with all tools of control, in the last couple years, we have seen governments, corporations, and various institutions misuse censorship for political, social, or economic benefit of certain parties. Because of this, many people around the world are finding ways to subvert any censorship and to promote the free marketplace of ideas. 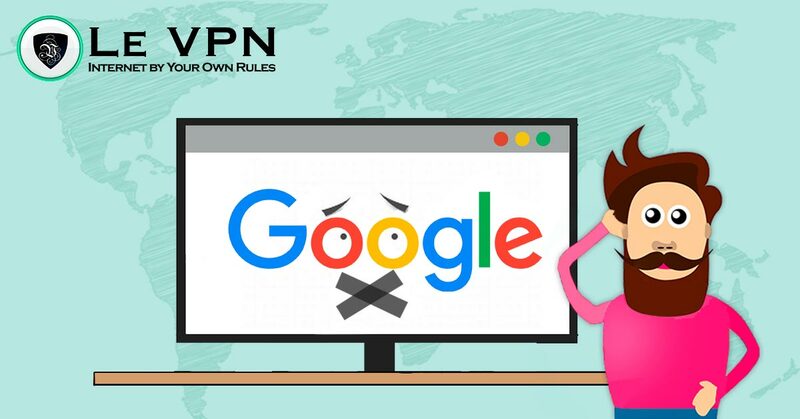 Whether it is by using a VPN, P2P networks, or by changing your search engine and browser, there are ways to bypass Google censorship and access everything on the internet, and leaving it to you to select what is the content that appeals to your sensibilities and what is not. Although the censorship Google imposes on its users in accordance to laws and regulations is one of the most basic and recognizable forms of censorship, that doesn’t mean that figuring out what has been censored from which country would be easy to find. While laws are public and easily accessible, ironically by a Google search, finding the exact directions governments have provided to the company are usually not, and could only be easily seen by direct comparison when using a VPN. If you were to use a VPN service with a diversified number of servers in multiple countries like the one provided by Le VPN, it would be easy to realize that some searches and some content are completely removed when performing a search in some countries. While some changes and censorship were to be expected, such are the restrictions Google has made with the People’s Republic of China excluding political dissent from the search, some were very interesting. Namely, if you were to use Le VPN to switch to a server in Australia, you wouldn’t be able to find the satirical website Encyclopedia Dramatica (a spoof to Encyclopedia Britannica) as this website was blocked by Australian Internet Service Providers (ISPs) because of the derogatory page about Aboriginals. Even though this website is known to post derogatory pages about everything and anything, it was still affected by Google censorship and excluded from any Google search inside Australia. Aside from the censorship forced by the government Alphabet Inc. has internal rules as company policy, which they have used on multiple occasions to exclude certain words or terms from their search. While this is usually something that could be considered illegal in the United States where the company’s headquarters are based, some Google censorship was done on what seems to be internal political leanings from the company. As reported by 2600: The Hacker Quarterly, some words were excluded by Google’s instant search option and didn’t finish as results when searched, even if they were available as a search option. In some cases, this Google censorship includes terms which are wildly irrelevant. For instance, Google forbids the term ‘’MyLeak’’ to be searched by instant search, due to a campaign against private photos being leaked. Effectively banning this word, Google has damaged MyLeak, a company that makes water leaking sensors, excluding them from most indirect search results. One of the biggest impacts on the freedom of speech that Google has is over their video streaming service, YouTube. While YouTube has a convoluted company policy which is mostly unknown to the public, Terms of Service (ToS) are strictly imposed on all YouTube creators, with penalties ranging from demonetization to complete channel deletion. As these terms are quite vague and could be understood in various ways, this has prompted many creators to investigate if YouTube, and by that extent, Google (Alphabet Inc.), is forcing their own political agenda on their platforms. While Google rationalizes these actions by citing that the content is not advertiser-friendly, it is obvious that videos are demonetized based on some political preconceptions, rather than economic. For instance, most videos which speak about LGBT subjects have been demonetized and removed from search results unless the SafeSearch option is disabled. Similar actions are regularly performed against various religious and political commentators. In 2017, Dennis Prager from the PragerU / Prager University YouTube channel has filed a lawsuit against YouTube, citing that the company is regularly demonetizing conservative content. Similar accusations against YouTube, and by that extent Google, were placed from multiple groups, including both religious and secular groups in various countries, as well as both conservative speakers and LGBT activists. While this kind of soft Google censorship is not by any means illegal in the United States, most creators have diversified both the platforms from which they share their videos and the ways they get funded by the public. It is good to mention that there is no country in the world where internet access is completely liberated and that even the freest countries in this regard, which are Iceland and Estonia, have some legal restrictions. With this in mind, there are many counties that have severe internet restrictions that would even fall into the category of human rights violation where people are persecuted for their opinion or some other personal characteristic, and often for political action (see our article on the Top 10 internet censors). Iran, PRC, Syria, and Cuba have massive restrictions concerning all kinds of content, where a simple use of a VPN could open the internet considerably and where most proficient internet users to use this type of service not only to access particular online data but to even be able to communicate freely over social media and similar platforms. While the Land of the Free does deserve that moniker in comparison to most countries worldwide, there are some very visible problems concerning Google’s behavior towards some types of content (so again Google censorship). Primarily, Google has made a policy of acting under the Digital Millennium Copyright Act (DMCA) as if the complaints are presented bona fides, meaning that all of the content in question would be removed from the search results and any Google platforms before revision. As for Google’s (now Alphabet Inc.) subsidiaries such is YouTube, there is no direct censorship against content which is legal in the United States, even though the Company has made some efforts to enforce self-censorship on YouTube creators that produce religious, conservative voices or LGBT material, but that content is still available to users and is included in most search engine inquiries. The People’s Republic of China, or more colloquially called only China with the Republic of China which is called Taiwan, has some of the most severe restrictions on the free access to the internet imposed to their population. As to appease China to accept Google’s services to their vast market, the company has agreed to comply with all the rules and regulations made by the government, which includes not only the preference of some content in the searches, but outright Google censorship of considerable content, mostly including political information, but also historical fact and other data considered unsuited by the China’s Communist Party. Google’s Chinese version of their search engine, Google.cn, has informed their users about any content that has been removed up to 2012, after which the government has forced the Company to exclude this information from the search and to present the search results as unaltered. Those users in China that need a free access to internet content must use a VPN for China, and although there were some attempts to crack down on VPN services in mainland China, these have proved to be unsuccessful. Using a service such as Le VPN, which has a server in Taiwan, any person from China could access the entire Internet as the distance to Taiwan is short and thus browsing speeds are very good. The European Union has passed a certain type of regulation concerning internet content Article 12 of the Directive 95/46/EC, dubbed the right to be forgotten, meaning that Google is forced to remove any personal information or press releases about any person if that person demands it. While this is not seen as a direct attempt of censorship by Google, one of the leaks has shown that around 5% of the content concerning private individuals was done by criminals, politicians and public figures. In one of these cases, a former medical practitioner has appealed for the removal of more than 50 URL’s that describe his medical malpractice, for which Google complied. The sheer amount of red tape in the EU makes it more affordable for the Company to just delete any disputed content, although Google affirms that all of the content removed is judged on a case-by-case basis and reviewed by human eyes. While Germany and France are members of the European Union and have the same restrictions as the political entity, some additional provisions exist in the laws of these two counties which considers more content to be illegal and is thus removed by Google searches and excluded from the internet. This is due to very strict regulations concerning hate speech in these countries, what sometimes includes even ideas connected with extreme political ideas. Both France and Germany have forced Google to remove any content that might be seen as propagating anti-Semitism, white supremacy or any kind of religious fundamentalism, including both Christian and Islamic extremists. The most notable example of Google censorship is the one enforced by the Islamic Republic of Iran which has even more restrictions than there are in China. Not only do restrictions in Iran forbid from the search results any content even slightly opposed to the governing Islamic doctrine, it is also forbidden to have anything but the basic search results for other religions or even other Islamic religious practices outside of Shia Islam. Aside from religious content, users from Iran that are not using a VPN can’t access any adult content at all, and all LGBT content is forbidden even when not belonging to the sphere of adult material. As for the political content available in Iran, any content that promotes Israel and even mentions Israel in any kind of positive or even neutral manner is strictly forbidden by the government. Users in Iran have an option when using reputable VPN services, such as the aforementioned Le VPN, to use a server based in Azerbaijan, a country that has a wide internet freedom, and to surf the net as they so, please. See all VPN servers locations offered by Le VPN. As censorship is one of the primary tools of any government, especially one that is non-democratic, to control their population, there is no easy way to prevent internet censorship less than influencing government policy, which in most countries like China and Iran would result in severe punishment. For individual users and those that are not interested in politics, it is much easier to try to circumvent the restriction using a VPN or a proxy server, than to try to change the law. How to Circumvent Google Censorship? The easiest way to circumvent any internet censorship, including that imposed by governments and large corporations such as Google, is to use a reliable and reputable VPN service. To explore this subject we have used Le VPN, a reliable VPN provider that has servers worldwide, a solid internet speed and a myriad of security protocols that will both protect your anonymity and provide you with access same as that of users who live in countries with internet without restrictions. For example, if you live in China, you can easily use Le VPN to connect to a server in Japan or Taiwan, going around the restrictions made by the Chinese government. As this doesn’t impact the internet speed considerably, you will be able to browse and use the internet with the VPN in the same way you would as if you were located in another country yourself. Be advised that in some countries it is illegal for the user himself to access certain content on the internet and that, if reported to the authorities; you may be subject to fines or even more severe penalties. Because of this, be sure to always use a reliable VPN service that will protect your personal information and identity even from the government. Censorship as a phenomenon is not new, and it is unlikely that governments and corporations will stop using this tool to control the information available to the public. Google, while one of the biggest companies in the world, is also subject to this rule as it will never forgo the possibility of the market because of ethical concerns. Finally, it is up to the user to use a reliable VPN connection and to surpass the censorship rules of their country, while ensuring that the service they are using will protect their identity from anyone wanting the user harm.